Spoil your iPad Pro 9.7-inch and yourself to an amazing custom smart cover! A case prevents your tablet from being damaged. Place your favorite photo and have it sharply printed. Make your iPad Pro 9.7 a portable and secure mini movie theater. If your iPad Pro 9.7 does not yet have reliable protection, then you can now make your own case now! A custom iPad case not only protects your tablet from scratches and chips, but also gives your iPad Pro a very unique look. Your custom iPad case is made of flexible and durable material and fits your device perfectly. Using the smart case, you can even easily mount the iPad so you can watch movies or play games more conveniently. Strategically placed openings ensure that your device will still remain fully functional, so you can easily listen to music or charge your iPad Pro 9.7. 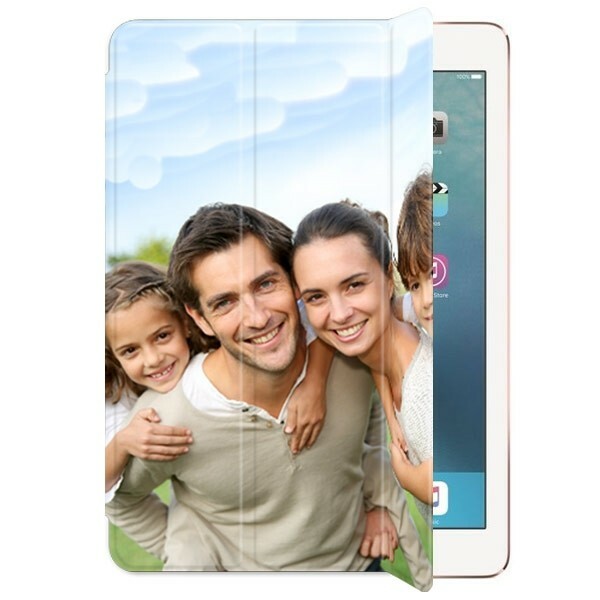 Your custom iPad case is made out of flexible, reliable and long lasting materials and your image is printed with high quality ink using an advanced printing method to ensure that your personal picture will not be scratched off easily. If you would like, you can add an optional hard case for the back of your device. So essentially your custom iPad case will consist of a smart case, which attaches to the sides of your tablet using magnets, and a hard case that will ensure that the back end of your device remains intact! Many people think that it’s difficult to design your own case. However, it is in fact very simple. Using our user-friendly design module, you can design a custom iPad case in no time. You can upload all kinds of photos directly into our built-in customizer, either from your PC, Facebook or Instagram. Do you have a favourite sports team? Use its logo right on your customized iPad case so you’ll have something special with you all the time. Are you looking for a customizble tablet case for the iPad Pro 12.9? You can design a custom iPad case for the iPad Pro 12.9 here! Creating a personalised tablet case: the steps. After you design your own case, we get straight to work. We complete all of our tasks with the utmost care and professionalism. Using advanced printing techniques and high quality inks, we can print your customized iPad case very quick and sharp. Create your own custom iPad case today! If you have any questions, you can always contact our support team at support@gocustomized.com.